Today, I’ll be talking about the importance of business plans and how to draft one. All too often, business owners start their businesses without creating a business plan. This is a mistake. A business plan will allow you to probe your ideas to see whether your business is viable. It will save time and stress and is worth all the effort. It’s an important and strategic management tool that gives your business a clear vision, goals and targets. It’s so much more than a document required by banks and other sources of finance. It helps your staff know what to do, it lays out responsibilities and deadlines. Ensure it’s easy to act on. When drafting your business plan, make sure it’s tailored and fit for purpose. My clients typically seek my help in preparing business plans for start-ups seeking finance, as well as more established businesses planning for growth. There are seven main sections of a business plan: the executive summary, market opportunity, competition, the team, the business model and financial projections. Current information – this states who the owners and managers are, any past trading history, and money invested in the business. Do your research! What’s your target market? How big is it? What are the strengths, weaknesses, opportunities and threats? This is important. If you’re going to pitch to investors, you have to know this information inside and out. If there isn’t a market for your products or services, you don’t have a business! Consider how you’ll market your business. What works best for your target markets? Is it direct sales and referrals, advertising, PR, digital and social media or a mix? It is vital that you research your competition. Where are they? Who are they? What are their products or services? How much do they charge? What’s their market share? What are their strengths and weaknesses? Where do you position your business in the market? How can you differentiate your company from the competition? Who are the people that are going to help you make your business succeed? If they’re already working for you, include brief biographies or CVs in the Appendix. If you haven’t yet recruited, include profiles and job descriptions. Explain their skills and responsibilities. Put team members into sections, for example research and development, production, finance and administration, plus marketing and sales. Decide how many people you need and when. What are your prices and how are these calculated? How will you deliver your products? Direct, through a distributor, or online? What are your cost elements, including packaging and distribution? What could cause costs to fluctuate? What are your overheads such as rent, utility bills and machinery? You should name your suppliers, and explain how your business will grow. Detail the manufacturing procedure, product components, and all related costs including staffing. Include three or five year forecasts for profit and loss, the balance sheet and cash flow. Also include a break-even forecast that shows how much income is needed to cover initial costs. Please see my other blogs for more on future projections. 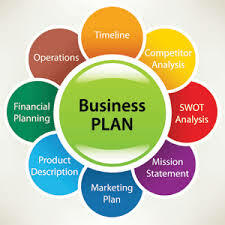 It is vitally important that business owners prepare a business plan, which is well thought through. It is also vital, that a business plan is seen as a living document with real strategic value, and one that needs regular review and updating. To quote Tim Berry, President of Palo Alto Software: “After you have buffed your plan to a shine, don’t file it away to gather dust.